Every do-it-yourself project-builder understands how important it is to know how to repair roof shingles. Fortunately, most projects relating to repairing or replacing roof shingles are basic enough that they can be tackled by the Calgary homeowner and won’t require the services of a contracted professional. However, it is important to realize that working on roofs pose a serious threat of danger, and it is vital to ensure your safety before working on a roof. If you don’t trust your abilities than you should contract a professional Calgary roofing contractor who is trained and more secure in handling roof work. If however, you feel comfortable working on your roof, and then by all means, you should engage in the project and repair the shingles yourself. Some roofs may require you to replace individual shingles, or you may need to tear off the old shingles and install new ones. When roof shingles become damaged, they can cause your roof to leak and suffer damage. 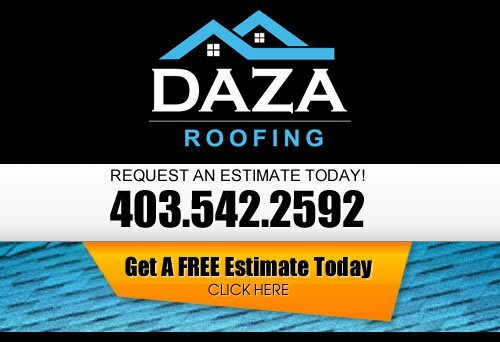 At Daza Roofing, our Roofing Contractor wants to be your Calgary Roofer. The first step in repairing roof shingles will be to gently lift the shingle tabs that are holding the shingle in place. It is also important to note if the broken shingle is actually nailed in or if it is a shingle that is adjacent to the broken one that you are replacing. You will need to carefully lift up the shingle tab, and then you can pry up on the nail head and remove the nail. Once you have access to the broken shingle, you can remove it easily. You may want to discuss a good workmanship warranty with the Commercial Roofing contractor as a safeguard against any faults with the construction. When you begin to discuss your job, be sure that you receive a written estimate, including a listing of the materials that will be used and the manufacturers’ warranties. The estimate should include not only the cost of materials, but also the costs associated with preparing the roof (either to remove the old roof or prepare for laying over the existing roof), as well as the costs of permits and clean up. If you are going to replace all of your shingles and start a new installation, then it may be beneficial to have a friend help you who has experience with roofing. If you feel confident in doing the project then you will begin by removing the existing shingles. This is accomplished by tearing the old shingles off. This can be accomplished by using a variety of tools. Pitchforks, shovels, and shingle scrapers are all used in the scraping and removing of existing tiles. With the shingle scraper, you can simply insert the scraper under the shingle, then lift. The scraper pries up the old shingles including any roofing nails. After you have removed all of the old roof shingles, you can then install the new shingles. If you are looking for a professional Calgary roofing company, then please call us today at 403-542-2592 or complete our online request form for a free estimate.